Are you a caregiver providing support for a spouse, friend, or relative? 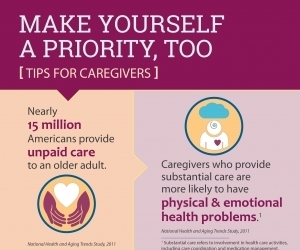 Taking care of yourself is one of the most important things you can do as a caregiver. Make sure you are making time for yourself, eating healthy foods, and being active. Finding some time for regular exercise can be very important to your overall physical and mental well-being. Physical activity can help reduce feelings of depression and stress and help you improve your health and prevent chronic diseases. Learn more about how exercise can help older adults. Share this infographic and help spread the word about caring for yourself while caring for others. Take exercise breaks throughout the day. Try three 10-minute “mini-workouts” instead of 30 minutes all at once. Make an appointment with yourself to exercise. Set aside specific times and days of the week for physical activity. Exercise with a friend and get the added benefit of emotional support. Ask for help at home so you can exercise. If possible, find ways to be active with the person you’re caring for. Both of you can benefit from physical activity! Pick an activity you really enjoy to make exercise something you want to do, not have to do.